September is National Chicken Month here in the US and we are celebrating with some #TastyTidbits about one of our favorite game day proteins. Buffalo wings happen to be one of our absolute, hands-down favorites on game day. The messier, the better. 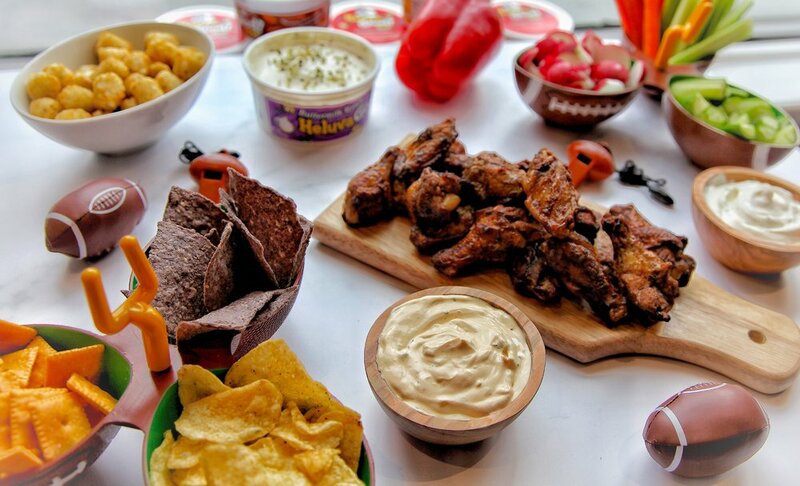 And it turns out, we here at Hungry Fan® are not alone in this wing infatuation. Americans love chicken. And on game day, we seem to really, really like chicken wings. As part of our newest feature, which we are calling Tuesday's #TastyTidbits, we thought we'd share some crazy fun facts that you may not know about chicken and chicken wings. This is certainly especially timely now that football season is back! So it might be considered an understatement to say that the Super Bowl is the behemoth of game day eating. It's the motherlode. It's the biggest day of the year for watch parties, homegating and for some lucky enough to be there, for tailgating too. So it's no surprise that Super Bowl Sunday this past February was a huge day for chicken wing consumption. According to the National Chicken Council (NCC) in its annual Chicken Wing Report (yes, this is really a thing), we hungry fans wolfed down 1.35 BILLION chicken wings. Seriously. Obviously, 1.35 billion is a big number. But to fully comprehend what this means, we thought we'd put it into fun facts that help us to better understand the gravity of this enormous number. - Enough chicken wings to circle the entire earth three times. - Enough wings to put 625 chicken wings on every seat of all 32 NFL stadiums. - 394 million feet of chicken wings, which when laid end to end along Interstate 95, would span from Lincoln Financial Field (home of the 2018 Super Bowl winning Philadelphia Eagles) to Gillette Stadium in Foxboro, MA ... almost 250 times. - 20 million more wings than we Americans ate last year. If wings were dollars, this 20 million would only buy us two minutes of commercial airtime during the Super Bowl. Are you more of a boneless chicken wing kind of fan? Or do you like it just the way the lord made 'em, bone-in and all? According to an NCC survey, if, in the question posed above, you self-identified as a traditional, bone-in wing eater, then you are among the 60% of wing eaters. Incidentally, research conducted at the start of the 2017 football season showed that 64% of chicken wings served in restaurants were bone-in. The research also showed that from September 2016 to September 2017, Americans ate 1.1 billion chicken wings in restaurants nationwide, which was up 6 percent from the year before. So boneless wings are out. (They're so 2015). And bone-in are in! (Much to our delight, because they're our fav too). Now, let's be serious for a minute. Like super serious. You can't have wings without a sauce to dip 'em in. What's your favorite? Ranch? Blue cheese? Honey mustard? Turns out the NCC folks surveyed Americans' favorite dip sauces as well. Turns out that 59% of US adults prefer ranch dressing (which is up from 51% in 2014 and 56% in 2015). Only 33% of folks said they prefer blue cheese. Buffalo Wings: Did You Know? 1. The Pacific Region consumes the fewest Buffalo wings the United States. Who eats the most? The South. (High fives to you, southern states)! 2. The average American eats 90 Buffalo wings a year. Buffalo wings have become a staple of the American diet, or so says Yahoo. We agree, but we'd add that a lot of these wings probably get eaten while we watch sports. 3. The world record for most wings eaten in 2015 was 444 wings in 26 minutes, which we thought was a lot. As of this past February, we have a new world record! Woof. That's insane. In 2015, it was Chicago's Patrick "Deep Dish" Bertoletti, who ate 444 wings in the 2015 Wing Bowl. Coming in a close second was a woman by the name of Molly Schuyler. She ate 440 wings. In 2015, Molly also set a world record winning the Emmenecker Challenge*, which consists of a 4 lbs. sandwich and 1 lb. of tater tots, in 2 minutes and 55 seconds. 4. Historians surmise that Frank’s Red Hot was the hot sauce used on the first batch of wings. 5. Historians also say that the Buffalo wing was invented by accident. necks from her chicken purveyor and was instead given chicken wings. So, she went with it and here we are today, us Buffalo wing crazy fools, still enjoying a happy accident. * The Emmenecker Challenge is eating an enormous sandwich made with pork tenderloin, an Angus steak burger patty, Texas brisket, applewood smoked bacon, fried cheese, buffalo chicken tenders, cheddar cheese and white cheddar sauce plus 1 lb. of tater tots on the side. In total, the meal weighs in at 5 lbs.